Many non-Greek friends believe that in Greece we either drink a lot all day long or we don;t drink so much comparing to them (I have heard both scenarios). While these are stereotypes, I get their point of view. The truth is that we may drink several times during the day, but these drinks accompany food. During lunch or dinner is very usual to see us drink wine or ouzo (especially in the summer) and sometimes there is no proper food but only "mezedes", which means savory snacks in Greek. And don you know which is the best "meze" to accompany your glass of ouzo? It's marinated anchovies, that's right! 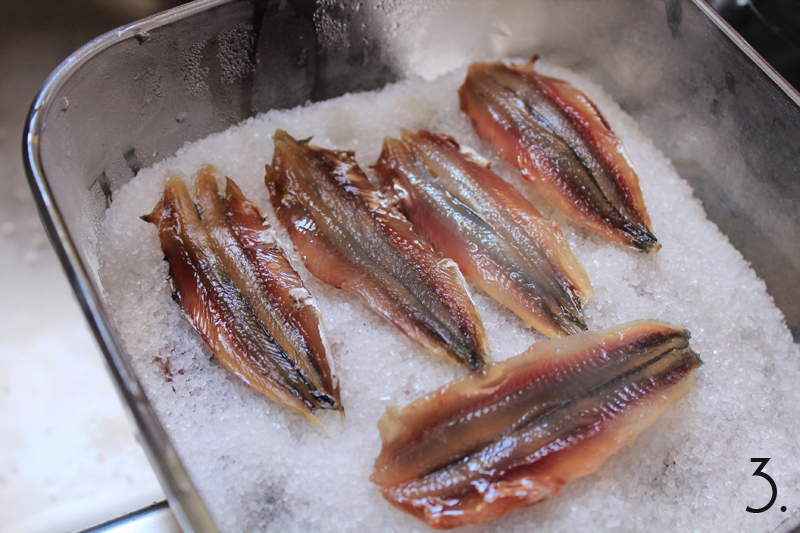 1) Wash and clean the anchovies by cutting his head with your fingers and pulling the gut too. With one's hand thumb press the tip of the spine and with the other's hand thumb, open the belly (pic 1). Carefully remove the backbone (pic 2). 2) Rinse the fillets with cold water, drain them well and place them, side by side and without overlappings, in a glass or plastic container ( never a metal one). Then cover them with coarse salt and place another layer of fillets. Cover them too with coarse salt. Put the container in the refrigerator for 24hrs. 3) When ready, the fillets will be whiter. Wash them gently, put them back in the container and cover them vinegar and lemon with a ratio 5:1. Leave them like this for 5-7 hours. 4) Then transfer the anchovies in a clean glass container and in between each layer add the chopped peppers, garlic, parsley and the ground pepper and cover with olive oil. Store in refrigerator up to 2 months. 5) When served sprinkle with chopped parsley and olive oil and accompany your ouzo with them. Cheers .